USE CROWN MOLDING TO FIX DESIGN BLUNDERS - Stanton Architects, Inc.
DESIGN DILEMMA: THERE’S A HOLE IN MY CEILING! 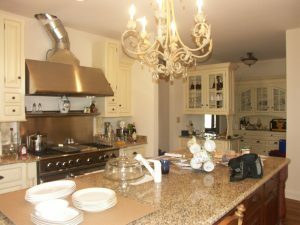 I have beautiful custom cabinets in my kitchen but the venting hood ducting was left open. It looks unsightly and there’s a hole in my ceiling! What’s the best way to finish this and match the cabinets? Matching the cabinet trim and color will make the space look uniform. The vent stack was covered from hood to ceiling hiding the hole. Some rules to consider when designing molding are scale of room and, in this case, design of cabinets. The molding here needs to have the same visual weight and proportion. Types of molding can be combined but they should all be painted the same color to look like one piece. 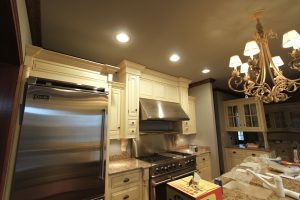 In this kitchen, the best solution was to build a façade matching the cabinets and add a dramatic crown molding around the kitchen. Below are guidelines to use when planning crown molding.